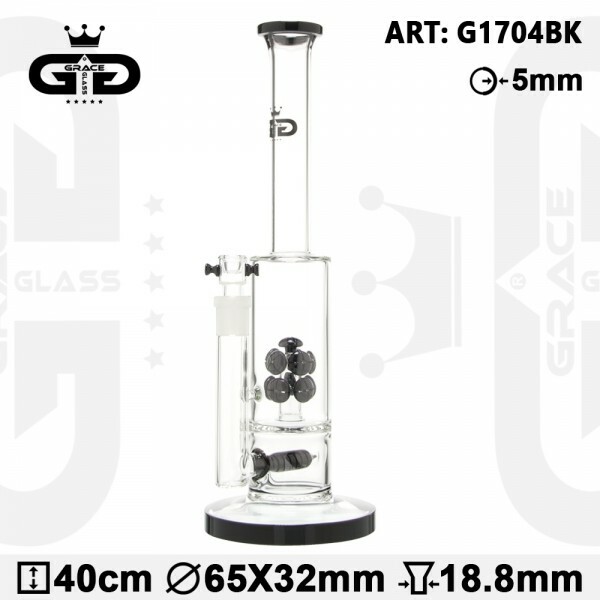 This Atomium Perc Bong of Grace Glass is a special piece of glass art that will excite your senses! It comes with some light touches of black upon the sturdy heat resistant borosilicate glass, formed in the shape of a flat base bottle tube. It is intended also for herb users. The detachable male bowl connects to an inside slit diffuser through a built-in chillum with a sure ground of 18.8mm diameter. The slit diffuser spreads your smoke into the water chamber so that it gets filtered by the water. An atomium percolator will furthermore bubble up your smoke. With the Grace Glass logo featuring at the top of the tube, the bong ends up in a mouthpiece ring for a more pleasant flavor.